New Look for our Model Engineering Show! Since the summer of 2017 the American Precision Museum has made great strides in furthering our education and interpretation initiatives to better meet our visitor’s interests and our stated mission. This updated event will highlight our focus on the historic evolution of machine tools in manufacturing, and Science Technology Engineering Arts & Math. The ‘M-squared’ part represents manufacturing. This community event, annually hosted by the American Precision Museum, will offer a wider spectrum of old and new technologies, from traditional model engineering to hands-on demonstrations, crafts, activities etc. to attract and engage a more diverse cross section of visitors to include more families, youth, and visitors not familiar with the museum or its history and collection. If you would like to participate as an exhibitor with a machine model, or other technology or related display please contact us. We hope you will join us in the celebration of the history of the evolution of machine tools, machine models, new technology and the spirit of innovation and creativity that continues to inspire our modern society. These are important key concepts in our education and interpretive mission here at the American Precision Museum. If you would like more information about becoming a Corporate Member of APM click here. A complete list of our members is here. April 30, 2019 is the last day of the fiscal year for American Precision Museum. Your contributions make APM attractive to visitors and students alike. If you have not made a donation or renewed your membership, please consider taking action before April 30. Thank you very much! This is something that I worked on the other week. It's called an inkstand. Perhaps its main virtue compared to the standard ink bottle topped with an eye-dropper was that its user could use it one-handed. At first I thought the end of the dipper was the remains of a brush, a mass of broken bristles. It turned out be a twisted piece of wire, like a spring. The little spring-thing is about 3/16" diameter. The colorful crystals on the spring are almost certainly copper compounds, implying that it was made from copper wire. The decal on the base of the device gives the last name Alteneder, the same name as the donor to the museum. 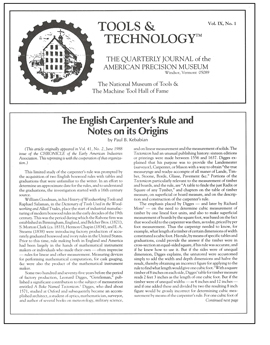 My son (a computer guy) found the patents from 1906 and 1930. The 1906 patent drawing shows how the device was used. It makes clear what the twisty structure at the end of the dipper is for. It draws up some ink by capillary action and transfers it to a draftsman’s pen. 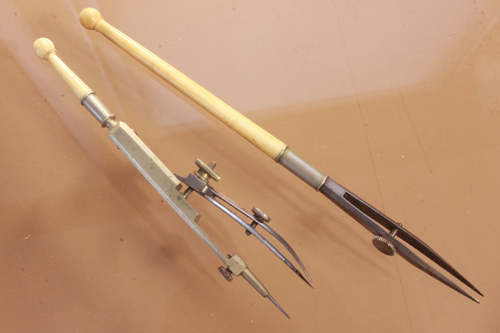 Here are two of the type of pens that the inkstand fed. The one is a plain pen, the other is a pen as part of a compass. You can see that the screw on the side will set the line's width. The plain pen is 4 7/8" long. The decal gives a patent date of November 14, 1930. My son found that the actual date of the patent was October 14, 1930. The decal was wrong by a month. Not only that, but it seems that none of the provisions of the 1930 patent were used in the inkstand that we have! 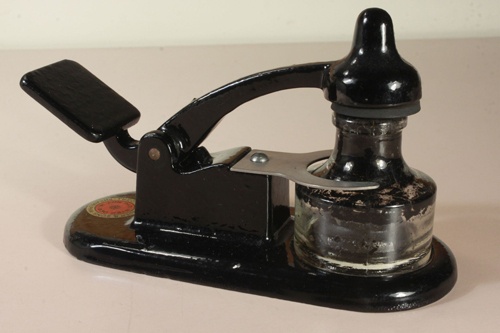 The main points of the 1930 patent refer to a cap that will prevent the ink evaporating. Presumably, the decal is on the device because the company had a supply of them. Working in a historical museum leads to adventures like these!